I'm alive! I cycled down the world's most dangerous road, careening down 64km from 4,700 metres to the jungle below at 1,100 metres and I survived! To be honest it wasn't that dangerous at all. 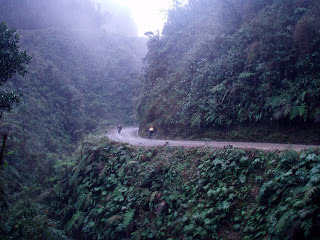 Sure, the "Death Road" is a bit narrow in places, 3.2 metres for two-way traffic, and there may have been sheer cliff drops of over 1,000 metres on the left, overlooked by rocky outcrops and ominous ledges on the right, and it may have been quite slippy, the rainy season making the gravelly dirt track that bit more treacherous, but - as I told Jenny often enough before we decided to plunge down through the clouds - a road is only as dangerous as the idiots who are on it. 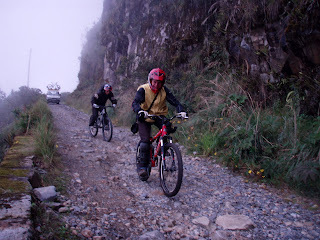 There were plenty of idiots on it, all like us, seeking to overcome the challenge of what is officially the most dangerous road on the planet - a long, winding track cut precariously into the sides of mountains which used to be the main route from La Paz to the jungle area of Yungas down below. Most of all the deaths occurred when it was still used by day to day traffic however, usually down to drunk driving or obstinence when drivers would refuse to give way to the other, causing one of them to tumble off to their deaths far below. Thousands of Bolivians have died on (or off) it since it was built by Paraguayan prisoners-of-war in the 1930s. Setting the tone for what would follow, many of those prisoners died on it too, and those who survived were promptly flung off for their trouble once it was completed. The country's worst road accident occurred on this road in 1983 when a bus careered off, sending over 100 passengers hurtling to their deaths. I'm sure any survivors were hurtling too, hurtling real bad. Most traffic now uses a new road built in the last three years of so, making the old one a bit safer for us as we attempted to plunge down on two wheels. Not too many tourists had been killed cycling down - only eight or so - although plenty have suffered very serious injuries. The signs weren't good beforehand though. A bus crash killed 22 passengers just the day before, and we would have to get ready for the descent beside a cross marking some other unfortunate's fatality. 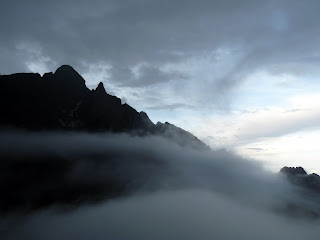 Snow-capped mountain tops questioned our wisdom as we glanced down into the valleys where clouds were nestled against the cliffs. The first part was grand, a lovely asphalt curvy route which we negotiated without too much trouble. Roadside crosses marked the scenes of previous crashes despite this being the "safe" part of the road. Of course, the Bolivians have to screw the tourists while they can and we all had to cough up B$25 to go past a checkpoint, before the dirt track part of the road started. That's when the real fun started, although it wasn't as much fun as I imagined. 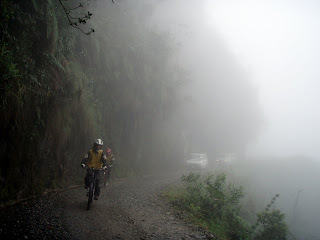 We'd been warned of the dangers of attempting this in the rainy season, and I could see what they meant as we literally cycled through clouds. Then the torrential rain started, drenching us before we'd a chance to get far. 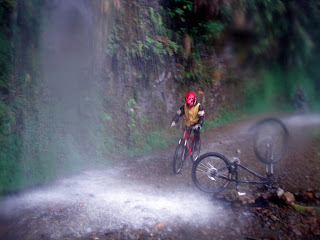 When it wasn't raining we were getting soaked under waterfalls cascading over the "road". It can hardly be called a road at all. 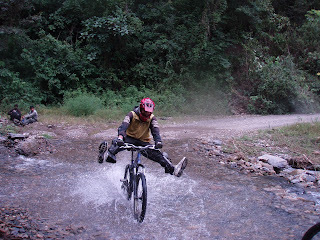 We had to cycle through strong rivers in places. Holding onto the bike going downhill was like holding onto a firing machine gun. I actually had to stop the bike to check if the front suspension was working. It was, but you wouldn't know it. My arms didn't thank me afterwards. Cato, the Australian who's been sharing our adventures since Uyuni, went flying off his bike, twice. Always going down under these Aussies. Catos always land on their feet though, so he was alright. Others weren't so lucky. One guy ended up in hospital after breaking his wrist, while plenty more suffered bad tumbles, scrapes and scratches. But we all survived, which is the main thing! Jenny and myself without injuries a bonus. 'Twas a deadly buzz man. A deadly buzz.